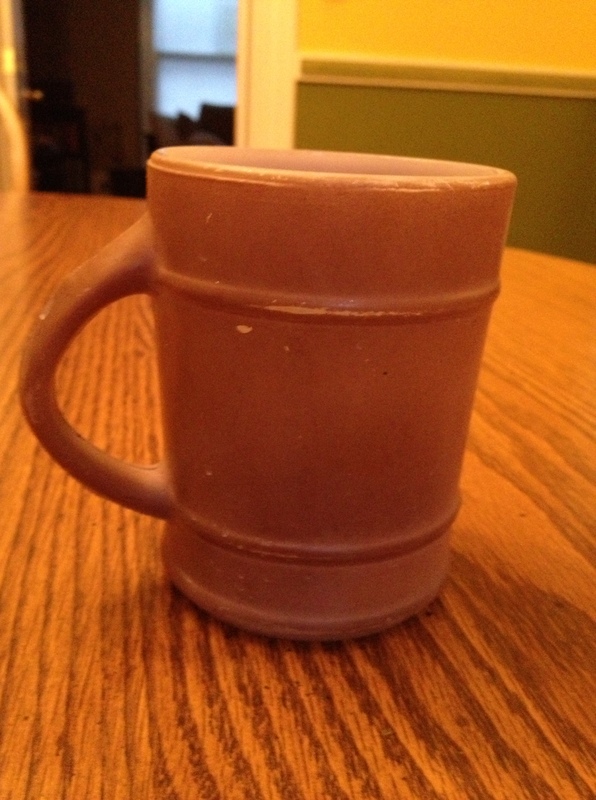 Yesterday, I wrote about my father’s coffee mug, and how it became my inheritance. It was also about how de-cluttering isn’t as easy as it sounds. In many cases I am firm believer in “get rid of the stuff, keep the memory,” but there are times when the object is itself the important thing – like with dad’s mug. You can bet that I will keep it as long as I can. Fortunately, not everything I own is that memory laden. In that same cupboard were also two modern, good looking blue mugs. They look like they would be great for soup or big mugs of hot chocolate. There is only one thing… when you put them in the microwave something about the finish causes them to gently spark, like miniature fireworks. In addition, they were gifts from my mom when I was separated, just prior to my divorce. I was living in a tiny apartment and had almost nothing. I just wanted to leave – and so I did, taking very little with me. My mom came to the rescue with dishes, pans, pots, towels and glasses and mugs. These were from that time. So while I remember her gifts with love, the actual mugs – they ended up in my garage sale box. In addition to stuff, I am also trying to unload obligations. I have a handful of promises out there – some spoken, some implied. I’m trying to cross those off the list one at a time as well. I try to settle my scores as they come up – to be on top of things. But for awhile there, I was running pretty fast and furious and I let a few things slide. It is okay, but it can’t go on forever, and now is the time I am trying to take care of those things – before they become too burdensome. I am writing thank you cards, returning things I’ve borrowed, setting up appointments… all those kinds of things that nag at the back of my brain. Next week I need to do a bit of traveling for work. It will be an enforced break from cleaning and organizing and thank you card writing. Honestly, I wish this trip was coming at a different time since I am on a roll right now. But I am not giving up all together! I will be working during the day, but the evenings will be mostly free. I plan on taking a lot of the magazines and books that have been piling up on my dining room table and finding time to sit with a glass of wine and a good read. Hopefully, I can clear some blank space, because it is starting to get ridiculous. Normally my life is very, very full. I have wonderful friends and family, and a terrific boyfriend. I have a dog. I do a lot of volunteering and have been moonlighting with freelance work. I am the President of the Board of Directors for a nonprofit, I have not one, but two houses – plus I am a landlord, not to mention the full time job that requires travel. In other words, I keep busy. But this fall, things are just starting to slow down a little. Usually when I have projects I want to work on, there is simply no time to do them. Now, for perhaps the first time in years, I actually have a little time on my hands. It feels like perfect timing. I am embarking on a new project. Last month my best friends and I had our annual garage sale. It’s a huge multi-day event that is a lot of work, but also a lot of fun. We have it down to something of a science – with a vast collection of brightly painted (and hilarious) garage sale signs, professional shelving and display racks (thanks to one friend who works trade shows), more card tables than you can shake a stick at, and a whole lot of drinking. (Alcohol is mandatory for a successful sale.) By the end of the last day, we are making deals and giving things away left and right. It is quite thing to see. One question always seems to arise – how can we manage to have a huge sale every year? I mean, shouldn’t we eventually run out of stuff to sell? We probably will someday, but so far every year someone has just moved, gotten married, had someone move in with them, or had some event that generates major closet cleaning. Personally, I keep a box in the basement with labels and pen nearby all year round. When I decide it is time for something to go, I slap a price sticker on it and pop it in the garage sale box right there and then. Inevitably, I also end up walking around my house looking for more things to get rid of… while the sale is happening. It isn’t about the money, we tend to price our stuff cheap. Our goal is to move it out of our homes (where it has been collecting dust,) and into the arms of someone who will love it. So, every year I end up walking through my house searching for more stuff to add to the sale. I love watching things go down the driveway with someone who is happy about their find. Then I see what my friends add to the sale and that inspires me more. Someone might throw in a hat, and that reminds me that I have one I haven’t worn, or I see pile of purses and it makes me look through my own to see if there are any I am done with.